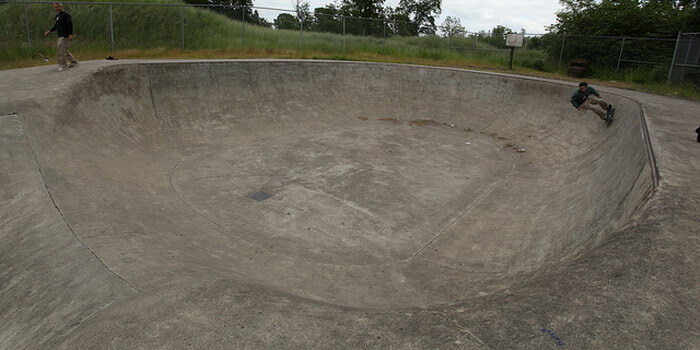 Location St. Helens Oregon skatepark: Approximately l hour north of Portland out on highway 30 to the town of St. Helens. Directions: Take Highway 30 out of Portland and follow the signs to St. Helens. Take a right on Gable Road. Then take a left on Old Portland Road. Take a left at the first light. Take a left into McCormick Park. Description: This is a brand new skatepark, which is located inside of McCormick Park. Roughly one acre has been allocated to the skatepark so as time goes on and money allows, more will be added. As of this writing, there is a 9-foot bowl that barely goes to vert, and couple of hips that drop into a 6-foot type halfpipe area. All of the structure is concrete and metal coping. One of the hips drops into what will be the street course. In the works are plans for a funbox and slider rails. Review: This park is really nice! The concrete work is terrific and the setting, which is part of McCormick Park, adds nicely to the atmosphere. The big draw for stunt fans will be the enticing double bowl at the center of the park, thought to be the largest north of Huntington Beach, Calif. For a break from skating, or for the other members of the family, McCormick Park has many miles of hiking trails and dozens of shaded picnic tables. There are also a couple of baseball diamonds in case you want to toss the ball around while the kids are skating. This skate park will be fun for all age groups. The street course is not completed yet so we do not have an opinion on its the technical difficulty.